Scottech is proud to present the latest data logger from Campbell Scientific; the CR300. Campbell's first datalogger with native 4 - 20 mA. 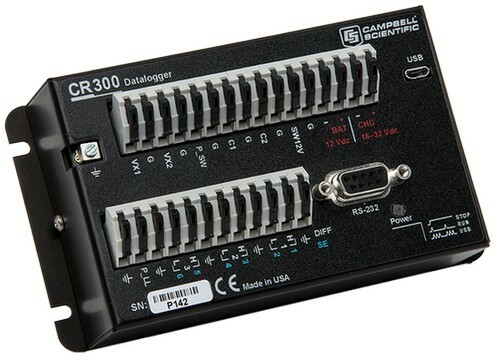 The CR300 is a multi-purpose, compact, low-cost measurement and control datalogger. It has numerous improved features and technologies over the CR200. The CR300 is ideal for industrial and small applications requiring long-term, remote monitoring and control. The CR300 is compatible with nearly every available sensor. This includes analogue output voltage (0 to 2.5 V) and current (0 to 20 mA or 4 to 20 mA) sensors, thermistors, and RTDs. It is also compatible with pulse or frequency output sensors such as anemometers, rain gauges, and flow meters. SDI-12, Modbus, and other serial sensors are supported with the RS232 port and C1 and C2 as a Tx/Rx pair. 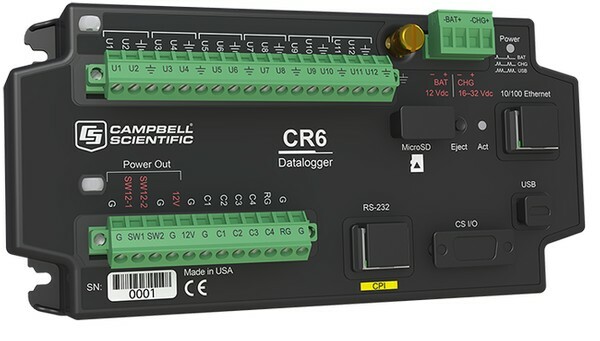 Last year Campbell Scientific released their new flagship model datalogger, the CR6. Campbell Scientific has combined the best features of all their dataloggers and added faster communication, low power requirements, built in USB, compact size, and an improved analog input accuracy and resolution. The CR6 also introduces the new universal (U) terminal, an ingenious way to allow virtually any sensor-analog, digital, or smart-to be connected to any U terminal. This is also the first multipurpose datalogger capable of doing static vibrating-wire measurements. The CR6 has 12 U terminals and four C terminals that are programmable for a variety of functions. This allows the CR6 to measure virtually any sensor, including voltage, resistive bridge, static vibrating wire, pulse, switch closure, SDI-12, and serial RS-232/RS-485.